Industry Experts published the new global market research report on Hydraulic Components. As per the new report ‘Hydraulic Components – A Global Market Overview’, the worldwide market for Hydraulic Components is projected to reach US$67.3 billion by 2022 from an estimated US$49.6 billion in 2016 growing by a compounded annual growth rate of 5.2% between 2016 and 2022. A growing impetus towards plant automation with a focus on enhancing productivity, reducing downtime and conserving energy has resulted in boosting demand for industrial hydraulic equipment designed for supporting process automation. Asian, Latin American and Middle Eastern regions have been at the forefront in plant and process automation, spurred on by the rapid pace of industrialization, development of manufacturing infrastructure and growth in GDP, a scenario ideal for robust growth in demand for hydraulics-based plant automation systems. Utilization of compact hydraulics in assembly automation provides several tangible benefits, including smooth lifting and lowering of loads, adaptability in pre-programmed machine speeds, decrease in cost of production and elimination of production downtime losses. The transportation and logistics industry, a vital cog in the manufacturing supply chain, has also been positively benefited by the growth in industrial activity. The consequent demand for material handling equipment, such as scissor lifts, dock levelers, stackers and forklifts, coupled with increasing in warehousing facilities, has been instrumental in stimulating demand for hydraulic component, such as cylinders and pistons. The use of hydraulic excavators has been bolstered by a boost in construction activity, a trend that has been more evident in developing markets. China, India Brazil and the Middle East constitute the emerging regions where the number and scale of infrastructure and commercial projects has been on the growth trajectory, which has resulted in creating healthy demand for hydraulic equipment. This global market report analyzes the hydraulic component product segments comprising Accumulators, Control Valves, Cylinders, Filters, Power Units, Pumps & Motors and Others. These segments further explored for sub-types of Accumulators – Bladder, Diaphragm and Piston; Cylinders – Double Acting and Single Acting; and Hydraulic Pumps & Motors – Gear, Piston and Vane. The study also analyzes the key end-use sectors of hydraulic components including Aerospace, Industrial, Marine and Mobile. 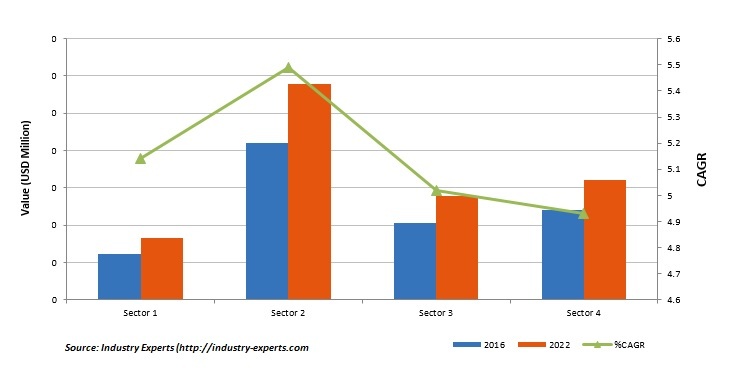 The global markets for the above mentioned product segments and end-use sectors are analyzed in terms of value in USD for 2012-2022 analysis period. This report provides the comprehensive market analysis for hydraulic components by product segments and end-use sector for the global markets comprising North America, Europe, Asia-Pacific, Latin America and Rest of World. Manufacturing activities across global industries have been witnessing slow and steady growth over the past few years following the economic downturn during the last part of the previous decade, a trend that is likely to sustain at least over the medium term. Manufacturing growth in developed economies is being driven by consumer demand, which, in turn, has been supported by renewed employment. The global automotive manufacturing industry has shaken off the torpor of its past and has been posting a stable growth. Developing economies are slated to exhibit production capacity expansion and growth in sales, which will have a positive impact on the market for automotive hydraulics integrated into transmission systems. Industrial sector is estimated the largest end-use market for hydraulic components with US$21 billion in 2016 and is also expected to post the fastest CAGR of 5.5% during the period 2016-2022 to touch US$29 billion by 2022. The global market for Hydraulic Components is segmented into aforementioned five major regions. The regional markets further analyzed for 13 independent countries across North America – The United States and Canada; Europe – France, Germany, Italy, Spain and the United Kingdom; Asia-Pacific – China, India, Japan and South Korea; Latin America – Argentina and Brazil. This 476 page global market research report includes 288 charts (includes a data table and graphical representation for each chart), supported with meaningful and easy to understand graphical presentation, of market numbers. This report profiles 47 global players and 62 overall major players across the globe. The research also provides the listing of the companies engaged in research and development, manufacturing and supply of Hydraulic Components. The global list of companies covers the address, contact numbers and the website addresses of 901 companies.